Most text capturing tasks can be done with other methods such as “Regular expressions match” or “Start with… continues until…” but for very specific cases you may need to write a script that captures the required information from the received email or even other sources. As you can see, you need to implement the method ExtractTextFrom() that takes any field (body, subject, CC, etc) as input and outputs a list of captured text strings. It is highly recommended to write the script in Visual Studio, using the Email Parser scripting SDK. 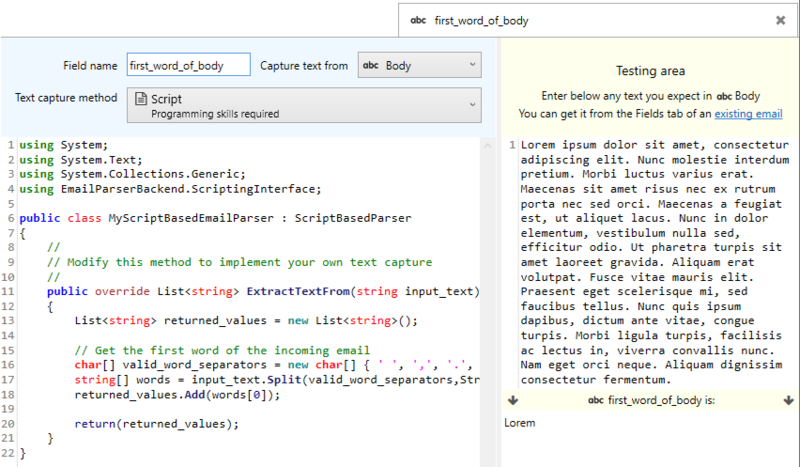 The text editor embedded in Email Parser does not have many useful features such as debugging, Intellisense, etc.